A customised climbing formwork solution ... three different ACS self-climbing versions with Vario girder wall formwork and Trio panel formwork. 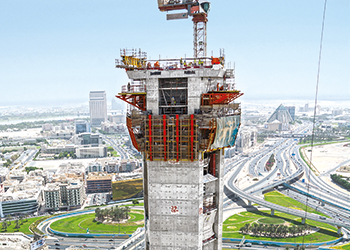 UAE-based contracting company Al Rostamani Pegel (ARP) is employing specially designed climbing formwork from Germany’s Peri to create an exceptional, walk-in work-of-art structure in Dubai: a huge frame whose crosspiece provides visitors with a spectacular view. For realising this building assignment, Peri formed a project team comprising climbing and formwork specialists. “From the very beginning through to the end, Peri supported the complex shell construction with precisely matched execution solutions. As a result, the angular core geometry could be realised within the very tight dimensional tolerances; in addition, 30 days construction time could be saved,” says a spokesman for Peri. The Dubai Frame, situated in Zabeel Park, is a 155-m-high and 93-m-wide frame – without doubt the largest picture frame in the world. The real backdrop of Dubai serves as a framed work of art. Glass elevators take visitors to the top where they can enjoy breathtaking panoramic views from the self-supporting 75-m sky bridge structure, which is fixed between the two towers. From there, visitors will have a bird’s-eye view of the historic old Dubai in one direction and as they turn around, will see the modern skyscraper architecture of the city in stark contrast. In the centre of the bridge, a glass floor provides an additional perspective of a direct view of the ground far below. Also at the base, both towers are connected by a walk-in cross frame which optically closes the picture frame and creates additional space for exhibitions as well as a museum. The profile of the over-sized frame is characterised by a very special shape whereby the two extremely slender towers have trapezoidal-shaped ground plans. Within the distinctly angular core geometry, the in-part only 30-cm thick walls had to be concreted and climbed. For this, Peri’s engineering team from Dubai designed a climbing formwork solution which exactly matched the specific project conditions. It combined three different ACS self-climbing versions with Vario girder wall formwork and Trio panel formwork. The solution provided rail-guided safe climbing operations without the use of a crane along with short cycle times. “Storey heights of up to 10 m and the particularly narrow shaft dimensions with minimal wall clearances made accessing all working areas more difficult. The only solution to facilitate easier access to the upper areas was a combination of elevated and suspended platforms,” says the spokesman. The ACS self-climbing formwork also allowed varying climbing options for the platforms which meant they could be guided either independently or simultaneously upwards. This enabled the construction team to quickly move from floor to floor resulting in a high level of productivity. Thus, work could be carried out crane-free in regular three-and-half-day cycles that ultimately saved valuable construction time. As a result, up to 3.5-m cantilevered and 1.4-m-thick intermediate slabs were constructed. SB brace frames from the Peri product portfolio were used horizontally and reliably transferred the very high loads. 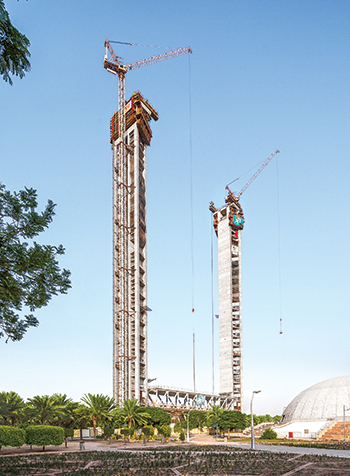 For forming the inclined reinforced concrete columns and the slab of the connecting crosspiece on the ground, Peri engineers likewise used system components for their solution. This mainly consisted of Girder formwork, the Variokit Engineering Construction Kit along with Peri UP modular scaffolding. ARP has realised numerous projects together with Peri in the past and appreciates the high quality of its solutions as well as the excellent standard of service. For this project, with its initially easily underestimated complexity, the company was provided with quick and efficient on-site support by the Peri project team when required through effective solutions for dealing with the complex construction tasks. ARP is the civil contracting arm of the Al Rostamani Group and is a noted player in the UAE construction industry.